Since it launched back in March of 2012, Taco Bell has now sold over 1 billion Doritos Locos Tacos (DLTs) in a span of less than 3 years. 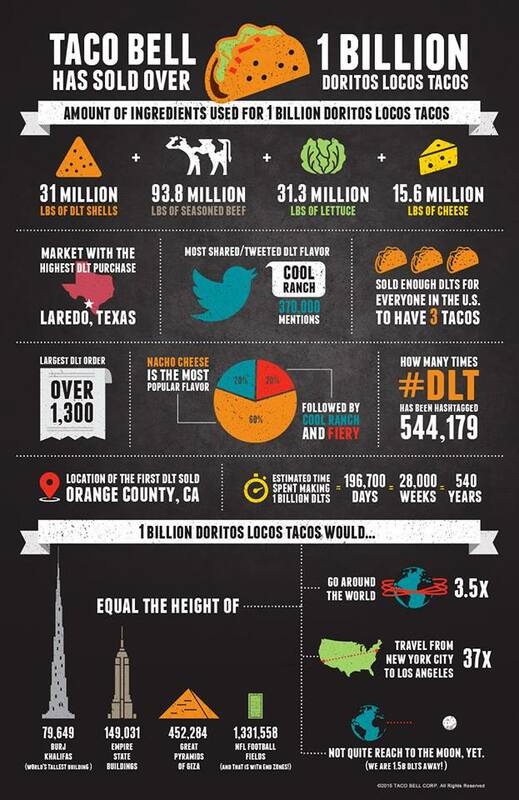 To commemorate the milestone, Taco Bell put out a infographic with some fun and interesting facts about the Doritos Locos Tacos. For example, while Nacho Cheese is the most popular flavor, Cool Ranch and Fiery are actually neck-and-neck in popularity. Other interesting facts include the largest DLT order (over 1,300) and the total poundage of the various ingredients it takes to make 1 billion Dorito Locos Tacos. Of course what we really want to know is: What flavor is next for the DLT?